Life's Tips and Tricks: How Do You Manage Your Time? 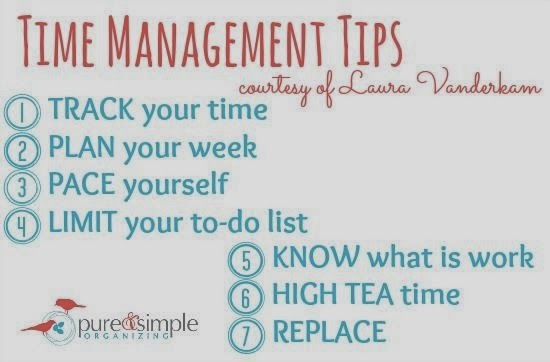 Seeing the above Time Management tips posted on my Pinterest wall jut reminded me what do I have to eliminate from my list or better yet, it gives me a hint that I have to redo my list. As I am now accumulating works, I think there is already a need for me to review my schedule and begin to think of how to track my time and tst my pacing for each work accordingly. That way, I would be able to manage my time effectively and wisely. I am actually planning to start reviewing my list now and hopefully, I could get better results in the next few days. Cheers to that!